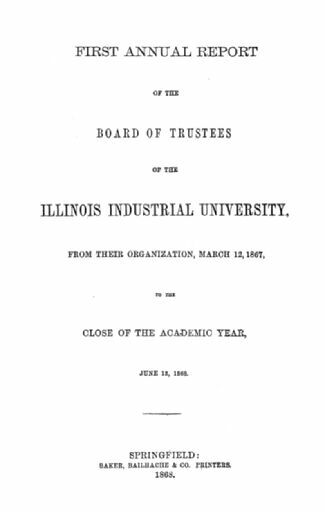 Digital surrogates of Board from Trustees Meetings Biennial Reports contain digitized copies of the University of Illinois Board of Trustees reports due to the Governor of Illinois, covering a period since the University foundation in 1867. Digitized material concern major decisions over board conformation and changes, University budgets, faculty designation and salary as well as salary policies, Campus management and improvement, different programs' curriculum design and revision, policies on research sponsorship and patents, and agreements with other institutions. Materials were digitized in a large-scale digitization project conducted by the University Library in 2007. The Board of Trustees Meetings Biennial Reports (Digital Surrogates), 1867- 2011 are managed by the University of Illinois Archives and do not feature precise descriptive information for each item. Discover their contents by browsing the folders and files. For more information, contact an archivist at illiarch@illinois.edu.